The Peoples Meeting Dome has been a temporary pavilion for The Peoples Meeting; an open political forum in Bornholm, Denmark, for the past 2 years. It is returning permanently in 2014 and will also act as an interactive platform for generating debate and discussion on the future of the housing industry. 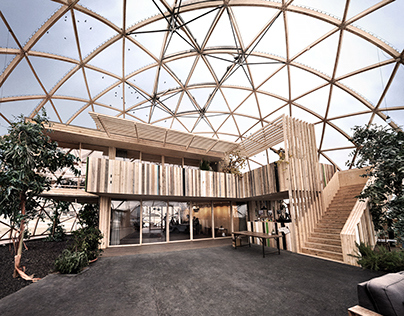 The client, BL (Denmark’s Public Housing) expressed that a standard tent would not do justice to a debate of such significance and wanted a space that would stand out, inspire and invite politicians and members of the public inside to participate. We wanted to create a space that encouraged debate between “ordinary” people and politicians, and chose a dome structure that would break down the traditional barriers between stage and audience, and create a strong sense of community and intimacy between all involved. 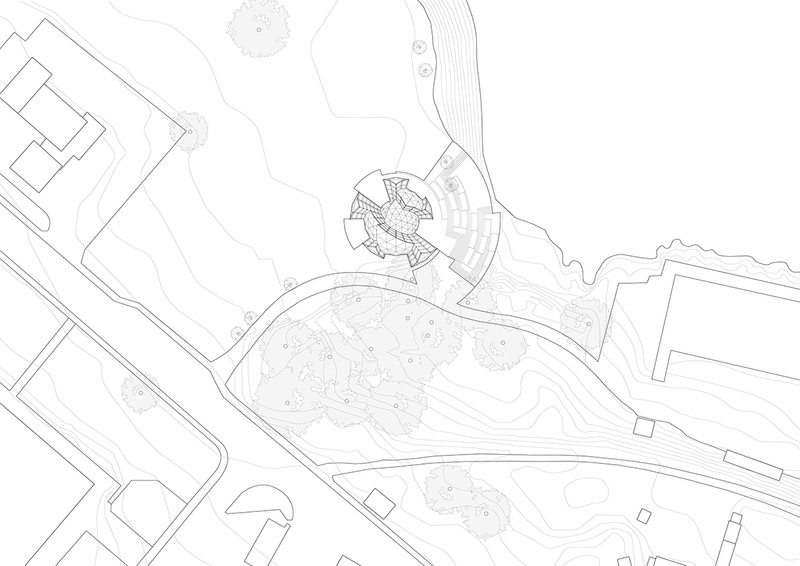 Where the geometries of geodesic domes are traditionally rational and static, our methods of deconstruction have allowed us to customise and adapt the domes, each year in Bornholm, to their specific sites at Cirkuspladsen and Kampeløkke Harbour. Through our experience with the two previous domes we have become very connected with the site and it’s surroundings. The new permanent dome has inherited this connection, experience and knowledge and consequently optimises the intake of natural light and beautifully captures ocean views from within its niches. Although the construction seems complex, the exposed loadbearing construction and joins allows the visitors the opportunity to study and understand it. The honesty of the architecture in this way creates two main focuses; the sustainable and intelligent construction and the beauty of the natural surroundings. The differences in the structure of the permanent dome are predominantly a result of wind and snow load and access requirements. 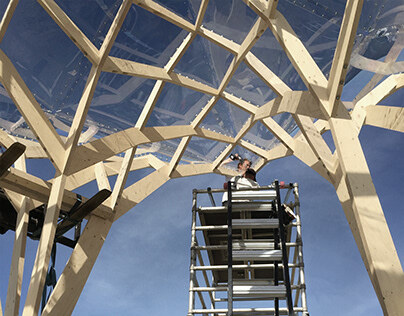 The skeleton has been scaled-up with several of the kerto glulam beams doubling in size and the timber façade panels increasing from 19mm to 300mm to create a fully insulated and weatherproof envelope. 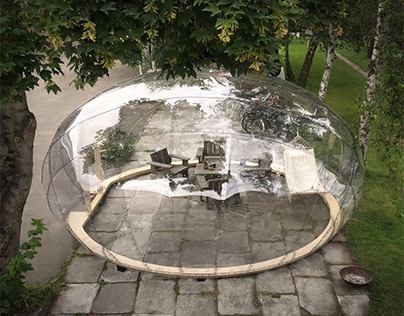 The plastic film windows have been replaced with a custom developed acrylic thermo material and a “rock heat” insulation system has been included to semi-heat the dome and keep the dome frost free. A new basement parterre forms part of the structures' foundation and contains the toilets and technical room. The large sheltered terrace, with new access ramps, is the perfect stage for the local circus, small concerts or yoga and tai chi with ocean views. 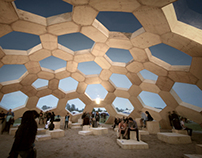 The idea surrounding the construction of the permanent dome is a continuation of that of the two previous domes; to produce a minimalist skeleton using the maximum capabilities of the geodesic dome structure -one of the most efficient methods of construction in terms of structural integrity and use of materials. Geodesic structures have all the advantages of being rationally and mathematically generated, but often lack many of the qualities we associate with good architecture. You could call it non-architecture. Our ambition was to intimately understand the construction of geodesic domes so we could play, distort, and reconstruct them in a way that still honors its sacred geometries and physical properties. In it’s original form, the Peoples Meeting Dome is a geodesic frequency four, with great circles forming the lines that cut and split its surface. The chipped surfaces of the dome are scaled from the center of the sphere and therefore remain true to the geometry. The surfaces in between radiate out perpendicular to the sphere surfaces. 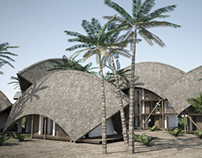 By dislocating and rotating the shells to suit the specific site, the traditional dome structure morphed. Niches, crevices and corners were formed, which, in turn, defined the openings and the enclosed spaces, and provided a framework for the various internal functions. The curved surfaces were consistently kept closed and the perpendicular surfaces transparent, which framed the light coming in and the views out to the ocean and surrounding landscape. 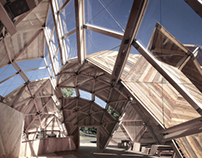 The lattice structure was prebuilt and assembled on-site using indigenous Douglas fir for the façade, floor and interior construction. The result was an intimate stage area housed within a niche and the stalls extending in to the center of the dome. This effect enhanced the focus on the stage area and created a great sense of intimacy amongst the participants. 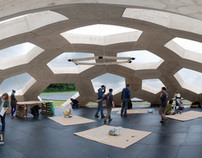 The spaces opened up as you moved out towards other activity niches, provided hives of community action and atmosphere. 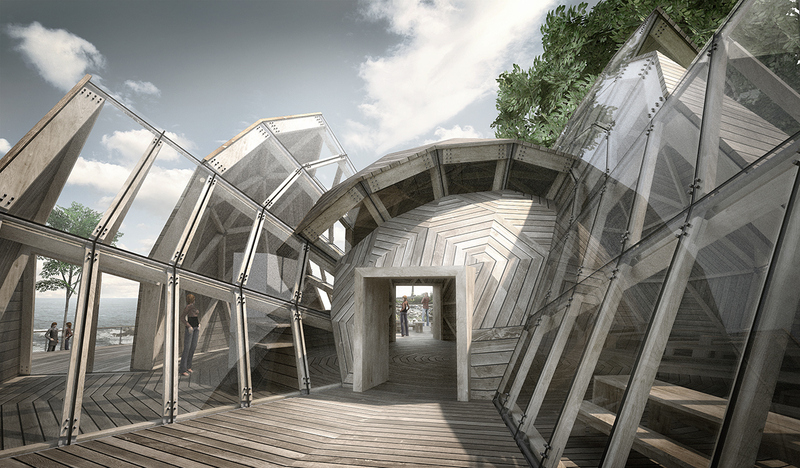 We proposed a lattice system, consisting of steel nodes with a timber skeleton, which could be either covered like a tent or utilised in more permanent ways. The structure has the ability to support the fully insulated walls of a house for example. The column-free lattice allows great freedom for the design of interiors and façade systems where windows and openings can be placed freely. The project was modeled using 3D software, enabling the steel nodes to be laser cut and robot welded, thus meeting the high precision requirements of the lattice structure. The nodes were designed as steel shoes that are two inches in one direction, and open in the other so they can accommodate the whole family of standard rafters. In collaboration with our engineer, we developed a table for generating timber strut dimensions based on required stress levels. 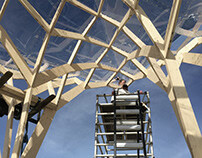 The dome was set on the site with half nodes, as were all other intersections of the structure’s surface. The ring of nodes were attached to inwards pointing beams and weighed down by 18 tons of steel plates that formed the floor and prevented the dome from lifting in strong winds. The building envelope consisted of translucent greenhouse membranes on the sphere’s curved surface and transparent PVC film as windows on the straight perpendicular surfaces. As this particular project was of a temporary nature, the façade was constructed of old boards that could easily be used for future purposes. 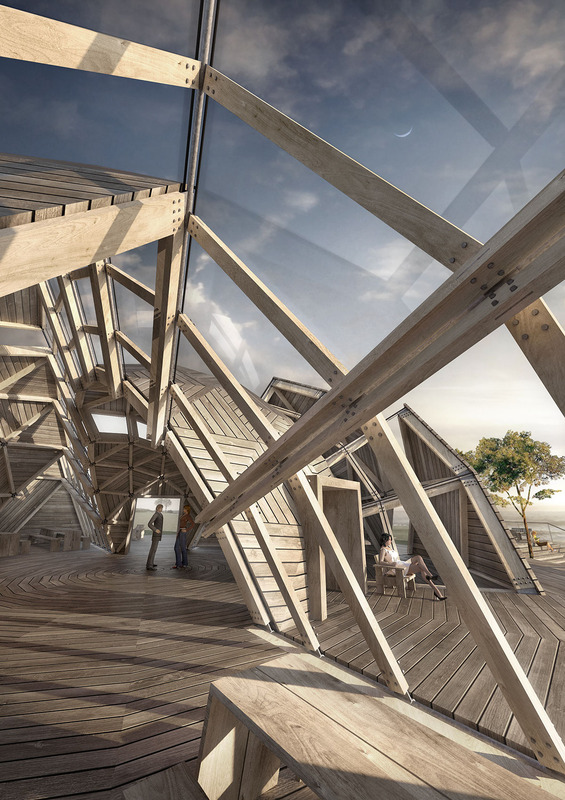 All parts of the pavillion were designed and built by Tejlgaard & Jepsen Architects. 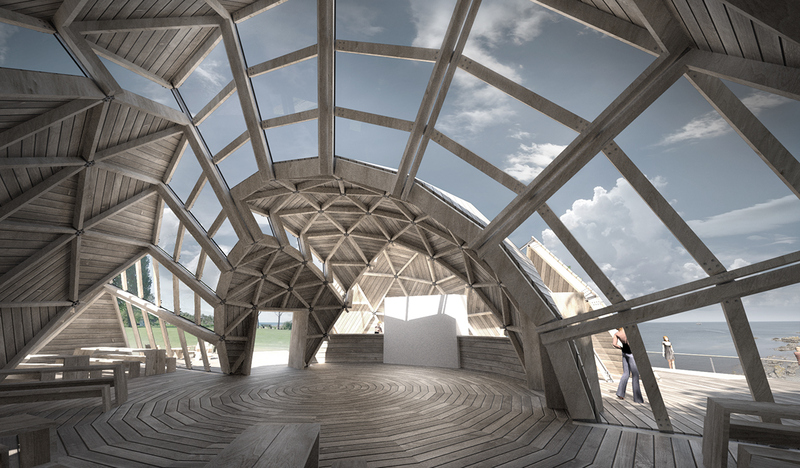 The Peoples Meeting Dome will return permanently to Bornhom in 2014 and is attracting attention from neighbouring countries who wish to replicate the forum and the pavillion it has been housed in.